Straddling Connecticut Avenue south of the National Zoo, Woodley Park is a neighborhood of fine early 20th-century row houses. To the east, the neighborhood's curved streets overhang Rock Creek Park. On the west, they bend on the slope leading to the heights of Mount Saint Alban, the site of Washington National Cathedral. The stately rows of meticulously designed houses are preserved intact, presenting streetscapes that have changed little for nearly a century. Though busy Connecticut Avenue is always just around the corner, the residential streets are green and serene. With its distinctive art deco design, The Delano is one of Keener Management’s swankiest luxury apartment complexes. 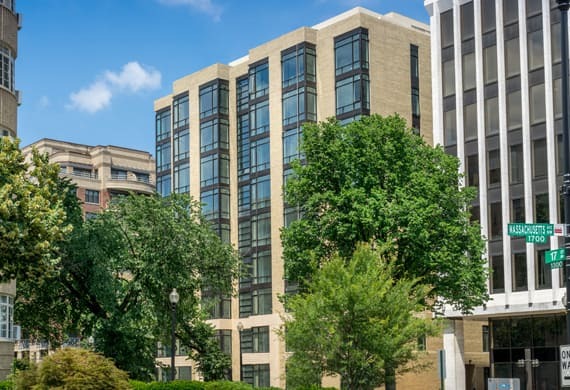 Located at 2745 29th Street in D.C.’s Woodley Park neighborhood, our newly-renovated apartment units feature high ceilings, hardwood flooring, stainless steel appliances, in-unit washer/dryer systems, fitness center, and outdoor lounge areas in a secured building. Listed as one of the “best addresses” in D.C., The Delano is located on a tranquil, tree-lined street just southwest of Rock Creek Park and the Smithsonian Zoo. Residents enjoy easy access to the Metro (Red Line) and an abundance of fine restaurants and shopping nearby. We welcome your inquiries into pricing and availability of our luxury apartment units in Woodley Park. Please contact us at (202) 234-7071, or email delano@keenermanagement.com. We look forward to helping you find your perfect apartment home. Learn more below about the features and history of Woodley Park. Woodley Park is nearly surrounded by green space, including Woodland-Normanstone Terrace Park to the west and Rock Creek Park and the National Zoological Park to the east and north, giving the neighborhood a distinctly suburban feel. Named after Woodley House, built in 1801 by the uncle of Francis Scott Key, a large section of Woodley Park is part of the Woodley Park Historic District. Many of the area’s early row houses (referred to as “Wardmans”) are still standing today. Grover Cleveland (the only president in U.S. history to serve two non-consecutive terms) and WWII Secretary of War Henry Stimson both called Woodley Park home during their political careers. Woodley Park is a short trip by car or metro to D.C.’s many historical landmarks and tourist attractions, including the District of Columbia War Memorial, the National Mall, the Martin Luther King Jr. Memorial, and the Smithsonian Institution. 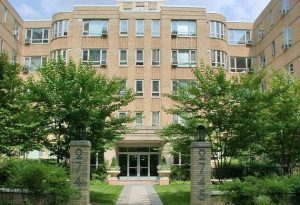 The Woodley Park community is ideal for families with young children and those who work in or around the nation’s capital. The neighborhood is served by the District of Columbia Public Schools system. Oyster-Adams Bilingual School is the neighborhood K-8 school today, formed in 2007 after a merger of two schools. High-schoolers attend Woodrow Wilson High School a few miles to the northwest. From soul food to sushi to classic American cuisine, there are plenty of dining options in and around Woodley Park. Bustling Connecticut Avenue offers additional restaurant options, as well as a specialty grocery store, several banks, dry cleaners, and other shops. The Circulator bus stops at larger stores like Target, Safeway, and others in nearby Columbia Heights. The Metro’s Red Line and multiple bus lines are accessible from Woodley Park. To learn more about pricing and availability at The Delano in Woodley Park, please contact by phone at (202) 234-7071, or email delano@keenermanagement.com.